We are an active diving club. The membership of the club has varied interests so dive trips run throughout the year and include dives suitable for technical divers, wreck enthusiasts as well as shallow wildlife dives for the photographers. 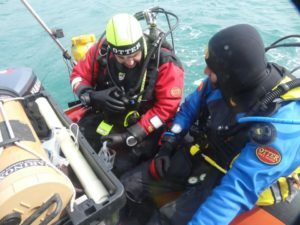 All of our diving is run under BSAC safe diving guidelines under the guidance of a Dive Marshal/Dive manager. If you want to arrange or discuss any diving trip talk to the organiser or the Diving Officer. Do you want to come on a dive trip with us? From day trips to inland sites, for training or experience through to week-long expeditions to the Southern Coast or further afield; everyone is welcome. We have the use of the club RIB for trips to coastal destinations (Humber – 4 divers and a cox’n) but for some trips we often charter hard boats, live-aboards and all-inclusive packages; whatever the trip needs. Trips are run by the membership for the membership. The instructors help to organise all of the training trips for Ocean Diver and Sports Diver trainee whereas Dive Leader trainees (and above) are encouraged to organise their own training dives with the help of the Instructors. We have a number of members who are approved to drive and/or tow the Club RIB. Any member of the club can organise a Club diving trip and we can offer help to get things started. For more details of the trips happening this year, see the notice boards in the clubhouse. All trips must be cleared with the Diving Officer before being posted on the Club emailing list, Facebook Group or notice board.